Just imagine this. You are working on a spreadsheet normally when all of a sudden you notice that you cannot move from cell to cell - instead of getting to the next cell, the arrow keys scroll the whole worksheet. Don't panic, your Excel is not broken. You have just accidentally turned Scroll Lock on, and this can be easily fixed. 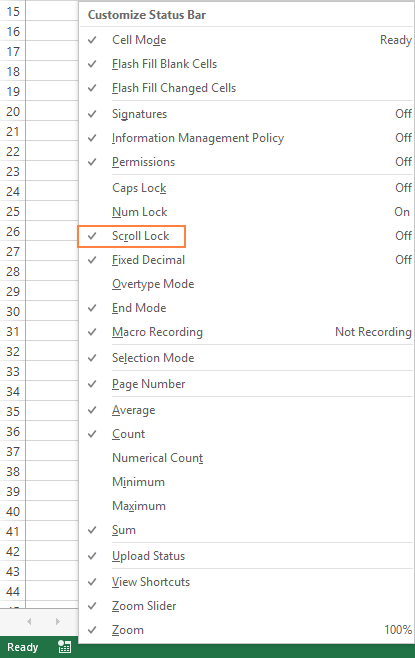 What is Scroll Lock in Excel? Scroll Lock is the feature that controls the behavior of the arrow keys in Excel. Usually, when the Scroll Lock is disabled, arrow keys move you between individual cells in any direction: up, down, left or right. However, when the Scroll Lock is enabled in Excel, arrow keys scroll the worksheet area: one row up and down or one column to the left or right. When the worksheet is scrolled, the current selection (a cell or range) does not change. Note. The Excel status bar only displays the Scroll Lock status, but does not control it. Much like Num Lock and Caps Lock, the Scroll Lock feature is a toggle, meaning it can be turned on and off by pressing the Scroll Lock key. As soon as you do this, Scroll Lock will disappear from the status bar and your arrows keys will move from cell to cell normally. 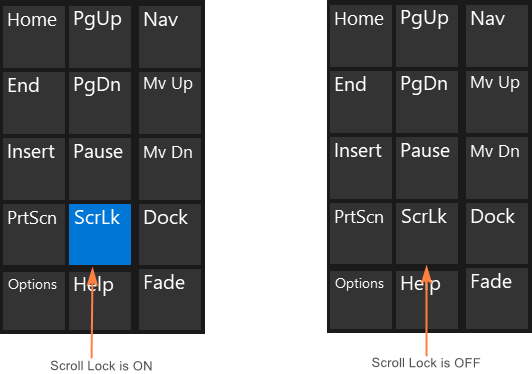 If you don't have the Scroll Lock key or it does not work for some reason, you can "unlock" Scroll Lock in Excel by using the on-screen keyboard. 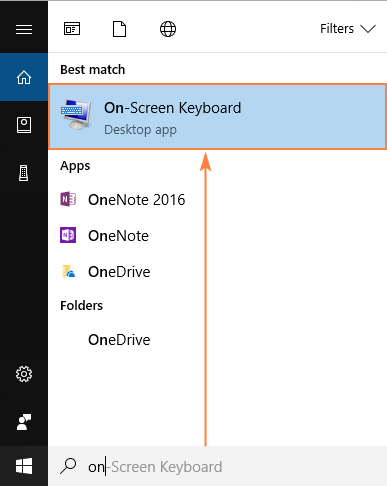 Click the Windows button and start typing "on-screen keyboard" in the search box. Usually, it is sufficient to type the first two characters for the On-Screen Keyboard app to appear at the top of the search results. Click the On-Screen Keyboard app to run it. The virtual keyboard will show up, and you click the ScrLk key to remove Scroll Lock. You'll know that Scroll Lock is disabled when the ScrLk key returns to dark-grey. If it is blue, Scroll Lock is still on. Click Start > Settings > Ease of Access > Keyboard, and then click the On-Screen Keyboard slider button. Click Start, press Ctrl + C to display the Charms bar, then click Change PC Settings > Ease of Access > Keyboard > On Screen Keyboard slider button. Click Start > All Programs > Accessories > Ease of Access > On-Screen Keyboard. To close the on-screen keyboard, click the X button in the upper-right corner. Unlike Excel for Windows, Excel for Mac does not show Scroll Lock in the status bar. So, how can you know that Scroll Lock is on? Press any arrow key and watch the address in the name box. If the address does not change and the arrow key scrolls the whole worksheet, it's safe to assume that Scroll Lock is enabled. On the Apple Extended Keyboard, press the F14 key, which is an analogue of the Scroll Lock key on a PC keyboard. If F14 exists on your keyboard, but there is no Fn key, use the Shift + F14 shortcut to toggle the Scroll Lock on or off. Depending on your settings, you may need to press the CONTROL or OPTION or COMMAND (⌘) key instead of the SHIFT key. If you are working on a smaller keyboard that does not have the F14 key, you can try to remove Scroll Lock by running this AppleScript that emulates the Shift + F14 keystroke. That's how you turn off Scroll Lock in Excel. I thank you for reading and hope to see you on our blog next week! 9 Responses to "How to turn off Scroll Lock in Excel"
Svetlana Cheusheva, thanks a lot for the article post.Much thanks again. Fantastic. Thanks for the solution, and most of know how to scroll off with on screen key board but the question is how and why it is getting on during working in excel. I work on excel every day for a long time and all of sudden it gets on, WTF? It is irritating and Microsoft should answer of fix this bug, it can't happen that it will on automatically without doing anything from user side. Thank you for this answer. My scroll lock was selected when I right click on the task bar, so I unchecked it and rechecked it again with no success. Using the scroll lock button on the keyboard solved my problem. thank you for this. I read a few posts/articles on the subject, and this was the most helpful. Went in and clicked the check mark off scroll lock and thought that would do it but it was still locked to my surprise. No scroll lock button on laptop or even on the electronic keyboard. Unreal! Not sure what to do now.